Make your documents stand out. Translucent plastic dividers provide a modern design for creating professional-looking documents. Clear tab labels virtually disappear when applied to the divider tabs. Format the clear tab labels with your existing software and print using your laser or inkjet printer. Quick, easy-to-create dividers look professionally printed. Ideal for larger projects requiring more than one divider set. Dividers are three-hole punched for use in three-ring binders. Avery offers many easy-to-use Avery Templates for Microsoft Word and other popular software programs. 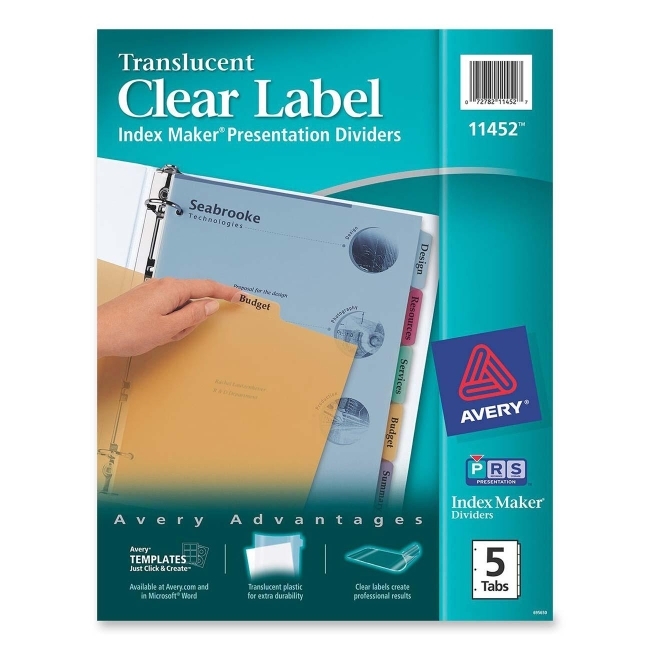 Dividers include a standard clear label sheet.